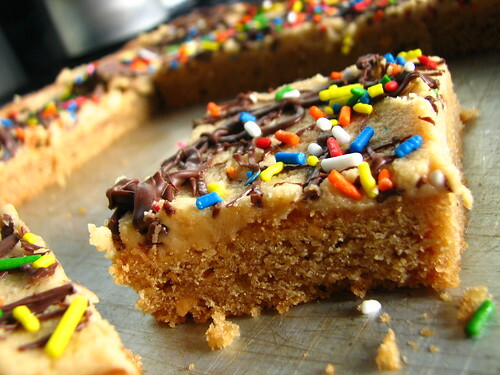 I concocted this recipe years ago, when my four older children were in school. I was making peanut butter cookies one day and didn’t want to take a long time to cook them, so I put the whole batch on the cookie sheet and baked them. After they cooled, I thought they’d be better with frosting, so I made up the frosting mixture and spread it over the cookie bars. 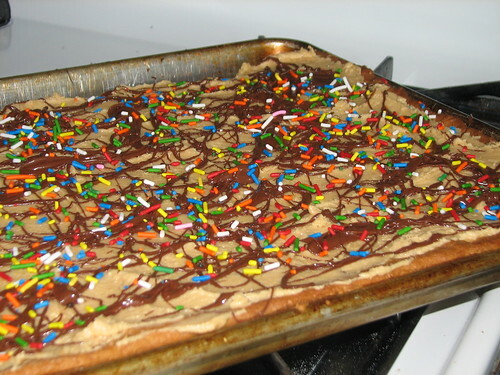 After making them a few times, I decided to dress them up with some chocolate drizzle and sprinkles. 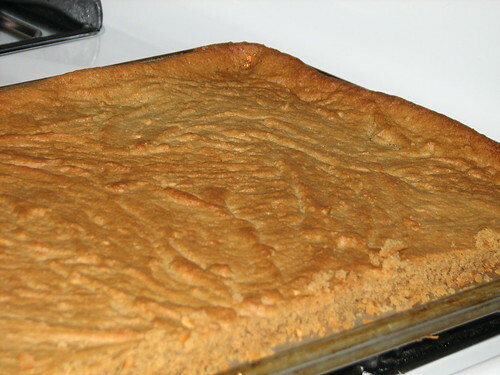 Preheat oven to 350*F. Grease a 10″ x 15″ cookie sheet with 1″ sides. Soften the margarine, if it is not at room temperature. [I throw the fridge hard margarine into my KitchenAid and let it beat it into creamy submission…but that won’t work well with most mixers.] 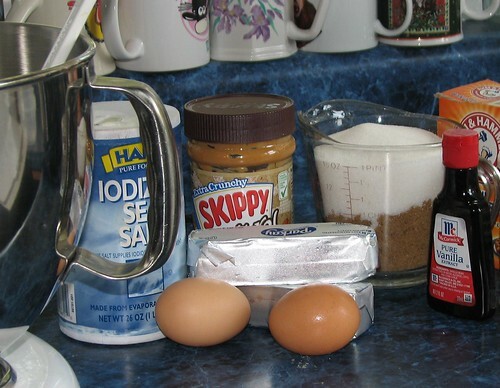 Cream the margarine and the peanut butter together. Beat in the two sugars till light and fluffy, then add the eggs and the vanilla. Mix well. In a separate bowl, mix the salt, baking soda, and the flour. Add it to the first mixture, combining thoroughly. 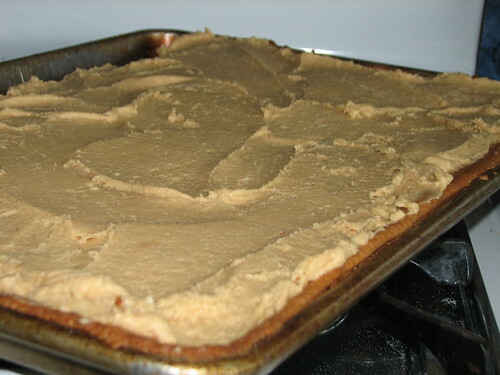 Scrape the mixture onto the greased cookie sheet and spread the dough evenly over the pan. Bake for 22-25 minutes. Dough will puff up during baking and then fall back as it cools. Do not over bake. 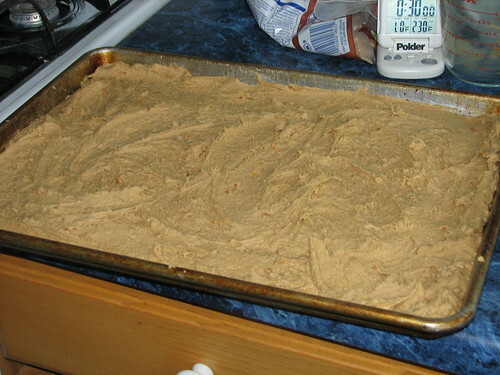 The dough may look like it is not quite done, but it should not be left in the oven longer than 25 minutes. Let it cool completely and frost with the following. Cream the margarine and the peanut butter. Add the other ingredients and blend well. If the frosting is too thick, add milk, a little at a time, until it’s of spreading consistency. If it’s too thin, add more powdered sugar, a bit at a time, until you like the feel of the frosting. Mine was a shade too thick, but I let it go. Doesn’t really affect the flavor. 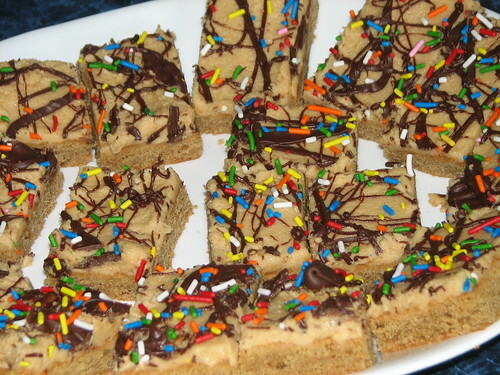 Frost the cookie bars and drizzle with 6 oz. melted chocolate. Garnish with sprinkles if desired. 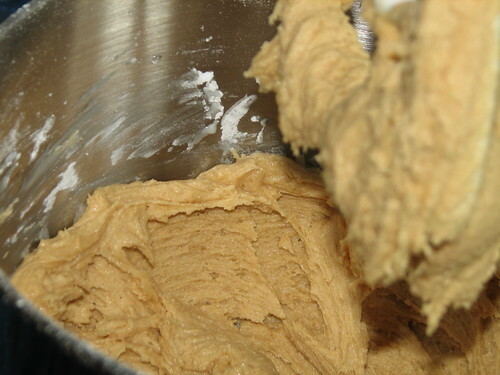 This entry was written by ~~Rhonda, posted on August 10, 2010 at 12:11 pm, filed under cooking, Recipes, Uncategorized. Bookmark the permalink. Follow any comments here with the RSS feed for this post. Post a comment or leave a trackback: Trackback URL. Have you ever made these with butter instead of margarine? I was wondering if you ever split the recipe in half?Because I dont think the two of us could eat that many?Or would they freeze well?